Moving beyond "the least of these" to "friend" — Ripple Community Inc.
All the eyes around the circle were on him. He sat patiently, wringing his hands, collecting his thoughts. "Afternoon everyone. My name is Jim and I want to share my journey of homelessness and addiction with you and where I'm at now." The youth group from Trinity Wesleyan sat quietly awaiting to hear the life story of a man they just met. Jim began sharing about his rough childhood and why he started drinking at an early age. His addictions led to bad decisions and there was a lot of pain in his stories. Jim's vulnerability and honesty were well received and when he was finished with his story, all the youth clapped for him. A little grin formed at the side of his mouth to reveal his pride at sharing his story. Through the power of story, we are able to breakdown stereotypes, open ourselves to new realities, and build empathy toward others. Jim is thankful for the way that Ripple Community Inc and Ripple church have been a place of belonging and growth. Jim is an important part of our community and now encourages others to attend AA and find change. Through the power of story, we are able to breakdown stereotypes, open ourselves to new realities, and build empathy toward others. We are always grateful for church groups or youth groups to come serve and visit with us. It allows our partners to see up close the work we are doing and be part if it. On Saturday afternoon, Trinity Wesleyan youth group and their youth leaders came with 75 Chick-Fil-A sandwiches to provide lunch. Everyone was grateful for hot, chicken sandwiches. The youth group did a great job spreading themselves out and starting conversations with strangers. It's always awkward to start conversations with people who are homeless or facing challenges. We often don't know the right questions to ask, don't want to offend someone, or look beyond a person's current situation. But from the chatter around the room, the youth were figuring it out. They were engaging our RCI members and building friendships. After everyone was done eating, the youth group split into 2 groups. 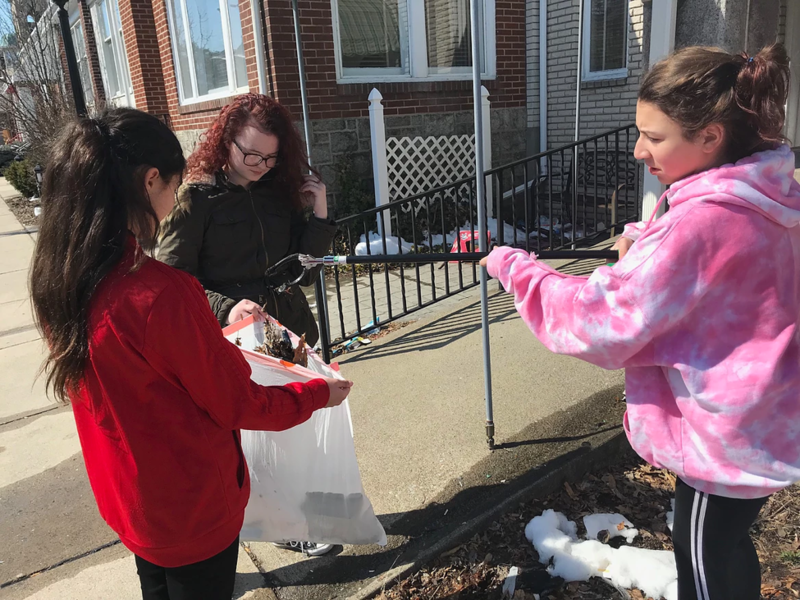 The Junior High group stayed at the Community Building Center to play bingo, while the Senior High group went to RCI Village to pick up trash. 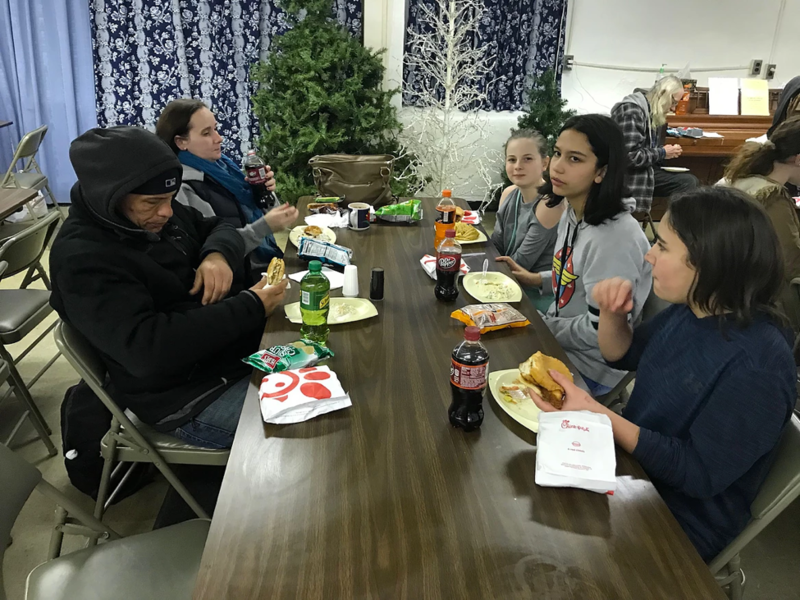 Both groups got a different experience and flavor of what Ripple Community Inc is all about, but both groups came away with a new understanding of what it means to build relationships with people living at the margins of society. Visiting our Community Building Center allows churches to move beyond serving "the least of these" to build lasting friendships that enrich our lives and community. When the 2 groups came back together, we debriefed the day and heard Jim's story. I was surprised by the maturity and openness from the group in their comments. "I came thinking one way about the people here, but realized they are just like me." "I actually have a similar story to some of the people here. It helps me relate to friends at school"
"Despite their circumstances, they have so much hope"
"Robert and Kelly were so nice and hopeful. I really enjoyed sharing a meal and talking with them." That is significant to me because she remembered their names. This young girl only spent a few hours at the Center with Robert and Kelly, but she cared enough to remember their names. When we take the time to learn and remember each other's name, to hear each other's life story, our biases fade away and relationships across diverse backgrounds are strengthened. We encounter each other as strangers, but leave as friends. Newer PostThanks to City Center!